For many people, the worst part of the holiday season is the hangover -- the debt hangover, that is. Debt has become such a burden that according to a recent survey by CreditCards.com, 13 percent of all Americans believe they will never get out of debt, and another 8 percent believe they'll be in debt into their 70s. That's 21 percent of Americans struggling with debt that they believe will last throughout their working lives. On top of that, nearly a third of Americans have new debt as a result of this holiday season. Now that the season of giving has ended, it's time for the season of digging to begin -- digging out of debt, that is. If you're part of, or worried about becoming part of, the 21 percent of Americans struggling with long-term debt,now is the perfect time to get yourself on track to make that debt a part of your past -- and not your future. Your debt represents money you're paying now for things that happened and decisions that you made in the past. Every dollar in debt is a dollar you're expected to pay back, probably with interest, and that interest adds to the total you need to pay just to get yourself back to even. Debt raises your costs of living today, reduces your flexibility to handle any future financial curveballs that life throws your way, and cramps your ability to free up cash to invest in your future. 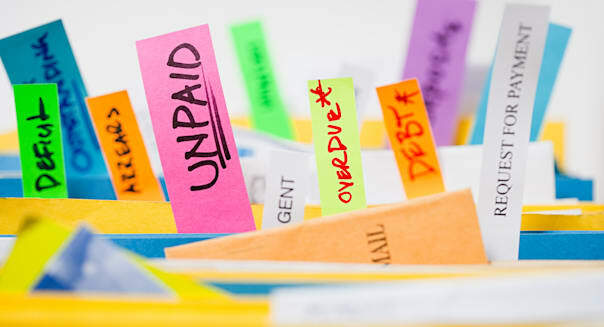 While there are some cases where a limited amount of debt may make sense, if not kept in careful check and judiciously reduced, debt can simply destroy your ability to enjoy your life. Still, if you find yourself in debt, there's no need to throw in the towel. There's a straightforward strategy that nearly anyone with a paycheck can follow to help you regain control of your financial life. It only takes five simple steps, and it's something you can start working on right now. Figure out where your money is going. For at least a month, track where your money is going. Use Quicken, Mint.com, a spreadsheet, or even a piece of paper and a pencil. Write down every penny -- whether it's an automatic payment, a planned purchase, an emergency expenditure, or a spur-of-the-moment buy. On top of that, jot down an estimate for expenses you don't pay monthly but do expect, like holiday shopping, car insurance, and property taxes. Review and prioritize where your money went. Look at your list of where you spent your cash, and mark each of those expenses as "Have to," "Want to," or "Can live without." "Have to" expenses are ones that are necessary to keep you alive and/or that you can't quickly change or get out of. "Want to" expenses are ones that improve your quality of life or are nice-to-haves but that you don't strictly need. "Can live without" expenses are those you look back on and say, "Why did I spend my money on that?" Cut the tail. Take your "Can live without" expenses and make a commitment to yourself that you will live without them -- at least until your debt is gone. If that's not enough to get you cash-flow-positive, start working your way up the "Want to" expenses as well, slashing those that are lower on your priority list until you at least see some money at the end of the month. Negotiate every remaining expense you can. Feel free to keep cutting out the "Want to" priorities if they matter less to you than getting out of debt, but by now, everything in your budget should be a "Have to" or a higher-priority "Want to." As long as you're in control of your money, you can spend a little bit on things that matter to you the most, but that doesn't mean you have to waste your cash. Nearly every expense is negotiable -- even medical bills and interest payments -- but you need to ask. If you can approach it from the perspective of "What's in it for the other person?" you might find your bargaining power is stronger than you thought. If times are really tight, even something as simple as, "I'm struggling to make ends meet. If you could help me by lowering the cost of what I'm paying you, it'll help keep me out of bankruptcy and allow me to keep me paying you" could make the difference. Snowball down your debts. Line up your debts in priority order, either by highest to lowest interest rate (the mathematically fastest way) or by lowest to highest balance (the most psychologically rewarding way). Then, start paying them off one by one, making the minimum payments on everything but your top-priority debt and throwing every penny you can against that top-priority one. Once that's paid off, repeat the snowball on the next debt in order, and so on, until they're all gone. By following those five simple steps, you can free yourself from the trap of debt that's threatening to ensnare more than one-fifth of Americans. Perhaps best of all, as part of following those five steps, you're putting your money where your priorities are. As a result, once you're out of debt, you'll already be in a great position to truly enjoy your newfound financial freedom. After all, if your needs and highest-priority wants are covered, you have no debt, and you've got money left over at the end of the month, then the world truly is your oyster. Keep that goal in mind, and get started now. Once you've put your debt behind you, you'll be incredibly glad you did. Chuck Saletta is a Motley Fool contributor. Try any of our Foolish newsletter services free for 30 days. Is your portfolio ready for the new year? Check out our free report on one great stock to buy for 2015 and beyond.